Sarasota Neurology strives to give you the best quality of life possible. PRP is a new, innovative treatment method to initiate and promote the body’s own natural healing mechanism. Are You Considering Surgery for Neck Pain or Back Pain? Neck and low back pain are common problems. They are among the major causes of lost time at work, decreased productivity and chronic disability in the United States. It is estimated that 80 percent of all people in the United States will suffer from at least one episode of back pain in his/her lifetime. For many this can be a recurrent problem. For some, it can be a chronic ongoing pain disorder. With proper medical evaluation, appropriate treatment, and selective use of diagnostic studies, the majority of patients with neck or lower back pain can be effectively treated without any invasive or surgical treatment. In his latest book, Dr. Kassicieh examines some important factors you should consider before making the irreversible decision to have surgery. For a limited time, this book will soon be available to you absolutely FREE for download. 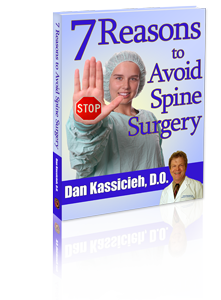 Please enjoy our video series overview covering several topics included in our soon to be released free ebook, Seven Reasons to Avoid Spine Surgery . Plethora's WP Themes are mainly niche oriented but so flexible that it can fit in any Business Site!